This Is GNN: Talking heads are decapitated during Guerrilla News Network's provocative videos. ELEVEN questions about the attacks of Sept. 11. That's what nine producers from the Guerrilla News Network asked people in order to make Aftermath: Unanswered Questions From 9/11. People interviewed in the video include Nafeez Ahmed, author of War on Freedom; Mike Ruppert, editor of From the Wilderness; and Peter Dale Scott, professor emeritus at UC-Berkeley. A sampling of the tough questions asked: Why wasn't the U.S. military able to intercept the hijacked planes? Were there plans for a war in Central Asia prior to Sept. 11? What did the Bush administration know and when? Is there an underlying motive for the U.S. military's presence in Central Asia? Guerrilla News Network (GNN) is an underground news organization with headquarters in New York City and production facilities in Berkeley. The network creates high-impact digital videos exploring important global issues it contends are ignored by the mainstream media. The videos are often combined with driving rock or hip-hop music. GNN will screen Aftermath, as well as a few other examples of its unique news documentary/music video combos, at Anno Domini Gallery in San Jose on Friday. 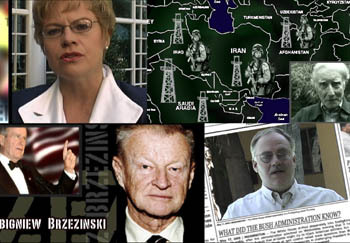 GNN will also screen S-11 Redux, a video criticizing mainstream media's gung-ho coverage of the war in Iraq, and The War Conspiracy, a documentary on how the CIA supposedly sabotaged the publication of Peter Dale Scott's book of the same name about oil companies and their role in the escalation of the Vietnam War. Stephen Marshall, GNN's creative director, has worked in more than 45 countries and has collaborated with Peter Gabriel and Eminem. A previous GNN video, Crack the CIA, investigated that organization's ostensible role in smuggling drugs from Nicaragua to the United States and won the Short Subject Audience Award at the 2002 Sundance Online Film Festival. Marshall was also the originator of Channel Zero, the world's first global VHS newsmagazine that combined ambient electronic beats with criticism of the mainstream media. "We're just trying to create a portal of entry for people who wouldn't normally know about these issues," Marshall says. "We're not really part of the whole conspiracy-theory realm--we're just asking questions." On their website (www.gnn.tv), there are videos investigating IBM's connection to the Holocaust, a parody of the TV show Cops exploring police brutality and the uncensored version of Eminem's "White America." Aftermath is no different. Narrated and scored by Bay Area rapper Paris, the video raises as many questions as eyebrows. Mike Ruppert says in an interview: "The press forgot to tell you that on Oct. 24-26 of 2000, the Pentagon held detailed drills practicing for an airliner being crashed into the Pentagon." According to Ruppert, this fact verifies the Bush administration lied when it said it had no idea aircraft could be used as weapons of mass destruction against the United States. Nafeez Ahmed, author of The War on Freedom: How and Why America was Attacked, September 11, 2001, suggests that the U.S. military's 30-minute delay in scrambling jets to intercept the hijacked planes was the result of something else besides incompetence. "This sort of direct violation of standard operating procedures," he asserts, "is inconceivable without some kind of high-level government approval." Marshall says that GNN produces "music videos for people who think," and regardless of whether or not one believes the theories expressed in Aftermath, one has to like the video's format: a combination of scrolling text, imagery, juxtaposed interviews and hip-hop sounds. Maybe there's a future for that dreaded word "multimedia" after all. From the May 1-7, 2003 issue of Metro, Silicon Valley's Weekly Newspaper.